This place is awesome! The beds are comfortable, everything stays super clean, the common area is lively, and the staff are super nice. Can't beat the location either! Super clean, laundromat nearby, beds were comfy lovely people and good location! love love loved this place. Was only here 24hrs but felt like I'd stayed for weeks with how friendly the staff were. Location is amazing as well. This was a great hostel in a great location. There are some awesome restaurants and bars really close to the hostel. They could improve on the cleanliness- it’s not dirty but another quick touch up would be appreciated. We stayed two nights at this hostel. The staff was friendly and helpful (and even helped us decide which thermal bath we should go to). The beds were very comfortable, with a charging outlet for each person. The lockers were quite large - my backpack was no problem, but a suitcase would probably fit too. The common areas were fairly quiet, but I don't think we were there during a busy time. The kitchen was well equipped, and the free coffee was great! I spent only one night at Bazar Hostel in Budapest, but I really love the atmosphere and the friendly staff there. 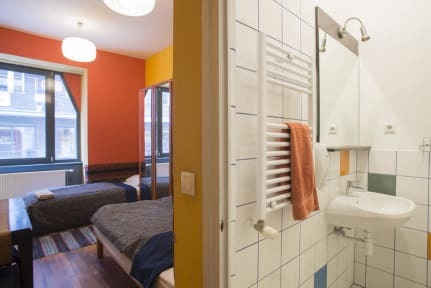 The shared bathrooms are surprisingly clean and the location is perfect to visit the main attractions and to have a drink at Szimpla Kert. For the price I paid it is really worthy and super recommended. 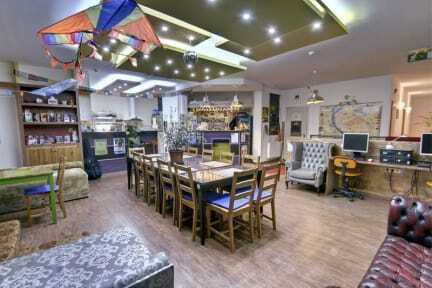 Great value and great location, within walking distance of the entire Jewish Quarter. My friend and I went in the off season, so understandably the hostel was kind of dead, and actually we were the only people staying in our 10 bed dorm most nights. The only negative was the ensuite bathroom, where the shower would run out of hot water after a single shower, and the floor would remain wet and dirty. We just ended up using the communal bathrooms with shower stalls, which were great. Was really cozy and homey, but the communal bathrooms were pretty dirty. Staff was very nice and friendly. Good location and amenities, really appreciated the free coffee.